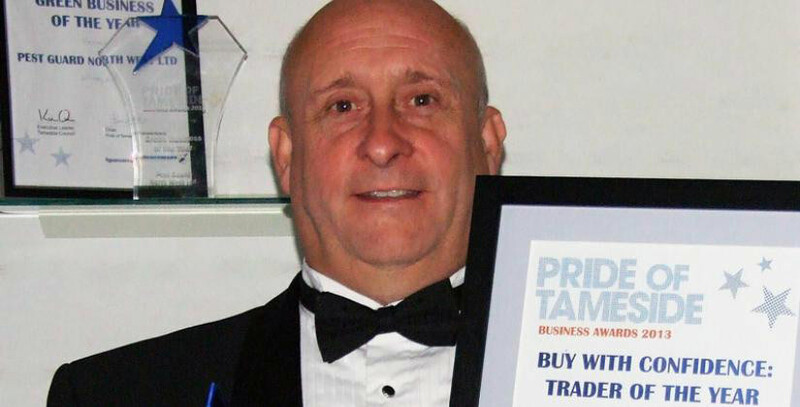 Pest Guard North West Ltd won the Trader of the Year category in this year’s Pride of Tameside Business Awards in a Las Vegas-style award ceremony. The ethical pest control firm, which is based at our Europa Business Park in Stockport, had already achieved success at the Pride of Tameside awards when it picked up the Green Business of the Year award in 2012. The business has more than two decades of experience in the pest control industry and specialises in using ethical methods to control insects and birds as well as non-chemical, non-biological and organic approved natural insecticides. The Trader of the Year category is designed to recognise members of the Trading Standards: Buy with Confidence Approved Trader Scheme, who go the extra mile to put their customers first. Judges praised Pest Guard North West Ltd for the free advice it gives to its customers as well as the way it has increased its contract base and turnover. Pest Guard’s Managing Director Kevin Harrison says: “It was an amazing evening and we are honoured to have won the Trader of the Year award, being recognised for our fantastic customer service, contract growth, and for embracing social media. Ever since we announced the win on our Facebook page we have been inundated with good wishes. The Buy with Confidence scheme aims to encourage businesses in Tameside to provide a high standard of business to customers by creating a partnership between local companies and Trading Standards, which runs the initiative. Europa Business Park provides is situated on Bird Hall Lane just five minutes from Junction 2 of the M60 motorway and close to both Stockport and Cheadle Hulme railway stations. It provides office space, workshops, storage space and studio space. For more information contact Business Centre Manager Andrew Hesketh on 0161 480 3203.